Looks like Mojave converted the fusion drive of my Mac Mini to APFS. If you have any disk utilities that do not support it keep that in mind. Any body try to clean install ? is it possible or must be upgrade ? I would absolutely update to Mac Mojave right away if I was on High Sierra, because High Sierra is Horrible Sierra. But Sierra or El Capitan are both stable in later builds, and so I have hesitancy to recommend from there at this point. I am running Sierra, and will continue to run Sierra for the forseeable future. I will try Mojave after the quirks are worked out which for “macOS” nowadays takes a while… for now I’ll sit on the sidelines. My attitude is similar to yours, but a few extra points. First, Mojave actually looks cool and has new features, so that is enticing. As long as you make a backup before you can also revert back to the prior OS, so updating to Mojave is pretty easy and reverting back with Time Machine is very easy. If you’re still on macOS Sierra or El Capitan, you probably stayed on those older releases for a reason. Is that reason still valid? Then maybe stay for a while longer. There is no rush to update when your current workstation “works” for you. I got it this morning and works fine so far. I did get scared at first because I was unable to log in. It turns out that Mojave now requires to have a password and I hadn’t bothered to set one yet because I just got the Macbook a few weeks ago and don’t use it much, so after installing the update I was unable to log on by just hitting enter after like before. Had to reboot into safe mode to be able to log in by hitting enter and then set a password. Upgraded this afternoon. Took about 40 minutes total, maybe a little less. System is running smooth as silk. No problems. May I ask: What model do you have? As long as it’s a 2013 or later iMac, ok to update. 2012 iMacs, stay away from Mojave if you are using boot camp to run windows. Installing Mojave on those iMacs will require ditching the boot camp partition (no idea why, but Apple published a support note on this). Same with me, took about 40 min and running smooth on MacBook Air mid-2013. I did notice, though, that MacOS Mojave now requires to have a password. I hadn’t bothered to set one yet since I just recently got the MacBook Air, which I inherited from one of my relatives who got a newer Macbook, and don’t use it too much. When it rebooted into MacOS Mojave after the update, I was unable to log in by hitting enter like before so I had to reboot into safe mode, where I was able to get in by hitting enter and then set a password, before I could log in and enjoy MacOS Mojave in normal mode. After Logging in, can you go on without Password? No, you do have to set a password. Hitting the enter key to log on to the mac when there is no account password is disabled in macOS Mojave when booting up in normal mode, so you won’t be able to get in unless you had a password. And if you didn’t set one before upgrading from High Sierra, as I said before you will have to boot up Mojave in safe mode to be able to log in by hitting enter and then go to the user prefs to set a password. Nuance Dragon 6.08 – latest version – doesn’t seem to work within any apps other than Google Chrome. Since Scrivener is my main writing app, that means reverting to High Sierra. Which Carbon Copy Cloner is struggling with. It should be. If Autodesk hasn’t optimized the app for Mojave you will get a prompt saying it’s not optimized, but it will most likely still work. Unless of course, we will still receive updates on High Sierra? High Sierra is still getting some updates. On the same day Mojave launched, High Sierra users also had access to the app updates for Safari (Safari 12, the same version included in Mojave) and the three iWorks apps. Yes. High Sierra will continue to be updated. When Apple releases a new OS, they always continue to support the previous OS with security updates for two years. So, High Sierra should remain supported until 2020. Sierra will have another year of updates. Like you, my 2010 MacBook Pro has, also, reached the end of the line for major OS updates. I installed Mojave on a 15” 2015 MacBook Pro. It starts fine but then then the mouse pointer (no external mouse attached) moves by itself to the top left corner and locks the screen. Nothing I have tried stops this. I can’t get into preferences to change settings as it locks the screen before you get there. Safe Mode and NVRAM reset haven’t helped. Any suggestions other than reinstall HS from Time Machine? After I had upgraded to Mojave, one of the first things I launched was Quicken 2007. I got a message warning me that Quicken 2007 is not optimized for Mojave and that it will not work with future versions of the OS. I have “upgraded” Quicken 2007 several times and have reverted each time because I have found that no later version comes close to meeting my needs, whereas I am totally satisfied with Quicken 2007 and have used it and its predecessors heavily for nearly 30 years. If the threat is carried out, I guess I will be stuck at Mojave forever. The warning message on app launch could be a few things…. My best guess would be that Quicken 2007 is 32-bit, and MacOS Mojave is the last version of MacOS to support 32-bit apps. So yes if you want to run 32-bit apps, Mojave is the last version to allow that, after Mojave it is all 64-bit. I can only guess as to why this is, but presumably dropping 32-bit support is to prepare for Marzipan iOS apps taking over all Mac apps to merge the two operating systems, at least from an app ecosystem perspective anyway. iOS dropped 32-bit app support a while ago, so now the Mac must do the same. BTW I still run Sierra, there’s nothing wrong with running a stable OS that supports the apps you need to use. Updating is not mandatory for many of us. If your tools work for you, no reason to get completely new tools that might not work. Michael, like you, I rely on Quicken 2007 although I’m trying to get used to the latest version. Does Q2007 work fine other than having to endure the message about future incompatibility over and over? Any update on Quicken 2007’s ability to work on Mojave? I have used Quicken for Mac 2007 for many years; it does all I need: track detailed spending and income with credit cards and bank accounts. I don’t use Q for stocks or loans. I began using Q for Mac 2007 on Mojave today. When I exited, Q notified me that no automatic backup would be made. However, Quicken did save my change, which was adding a deposit. Since I re-opened Q to check whether the save was made, I took the opportunity to manually use “File/Backup to Disk” to backup the file to a backup drive. The backed up file did appear as “Quicken Data.qdfm” as expected. Moved up to Mojave today and was surprised that my Quicken 2007 still performed fine. The warning only happens once I think (back when I was running High Sierra), so return of warnings in Mojave. I’ve turned off backups due to problems with it handling storage in the Shared folder. Time Machine and online backup covers me enough for now. Already purchased Quicken 2018 to test anyways given positive reviews online. I’ve also tried to update with each of the previous Intuit Quicken releases since 2007 and had returned to 2007 for Mac functionality each time. It has turned into a total disaster. Restoring from Time Machine wiped the hard drive but didn’t reinstall HS. Recovering from internet does not recognize the hard drive and machine has become completely unusable. Didn’t check the dates for macOS Mojave release, so I installed it yesterday on 28 September 2018 (Friday). I was mainly curious about Dark Mode which was advertised so much in the betas. I let it install overnight and then tested it out at work. The update installed with no problems and runs silky smooth. I believe the update and download of the installer was faster than High Sierra or even Sierra, as was the actual OS installation. I don’t have any problems with Mojave so far, though it’s only be a day now. I switched to Dark Mode just now before typing this comment and it’s beautiful! I didn’t think Dark Mode looked all that good on certain apps I use on Android, but I have to admit that Dark Mode does look kind of seamless and perhaps less strenuous than the light versions. I may switch most of my Android apps to dark mode for the same reason. Thanks for such a polished and easy to use release, Apple! I own a MacBook Pro Retina 13″ (Early 2015) for about two years now. May have swapped High Sierra for Majove prematurely. After the update, the mouse cursor frequently becomes uncontrollable. This happens whether or not the Magic Mouse is turned on. I’m going to reinstall Majove again in the hope the wild mouse is tamed. If not, I’ll reinstall High Sierra. As it is, my mid-2012 MacBook Pro is nearly unusable. When I upgraded from Sierra to High Sierra I was unable to print or scan anything for some weeks and had to use my old Linux laptop. It was not until the High Sierra updates came out that the problems were resolved. Learning point: don’t be in a hurry to ‘upgrade’. New features are always advertised, but old ones that no longer work are not. I’ve heard that some folk have had Time Machine problems with Mohave. That is critical for me so I’m not upgrading for now. Do we really need a new macOS every year with all the hassle it brings? I ran the update last night. It did the reboots and all automatically. But I notice the About Mac still says High Sierra. If your About This Mac screen says you are running High Sierra, then you are running High Sierra. MacOS Mojave is a different operating system from High Sierra. 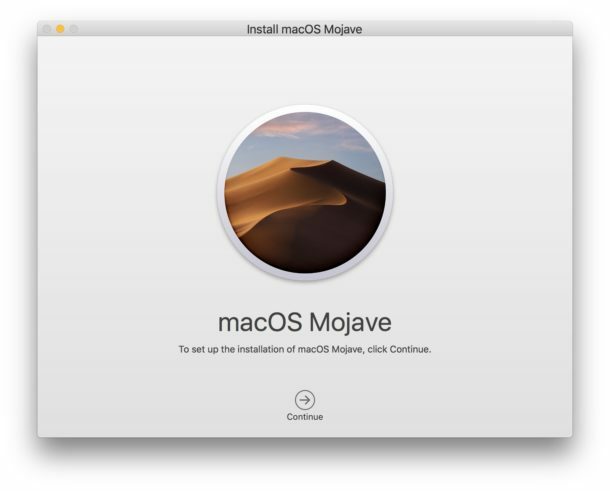 You can upgrade from High Sierra to Mojave.